So you have installed VAO, and have tested your plans and you are ready for a crisis. But you want to know how you can trigger one plan, and have them all go. Right? I can help with that. The overview is you do plans, test them and when happy you chain them. But you need to make sure the order of recovery is what it needs to be. For example, database’s should be recovered before the applications that need them. In a crisis it is best to have email working so management can reassure the market, customers and employees. In another article I am working on I will show you a method of recovering multi – tier applications fast, rather than the slow method – which I suspect will be default for many as it is obvious, and yet, there is a much better way to do it. In my screenshot below you can see my plans. I want to recover EMail Protection first, followed by SQL, and finally View. View requires SQL, and I need email recovered first so I can tell my customers, and employees that we are OK.
And yes, my EMail protection plan is not verified but I am having trouble with it so it needs more time. But we can still chain plans. When you do this, make sure all your plans are verified. 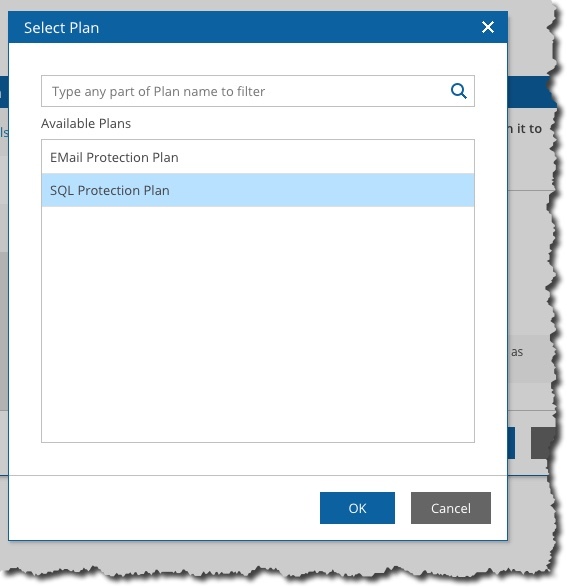 The next step is to right click on Email Protection Plan and select Schedule. You can also do that under the Launch menu too. Yes, we are not going to schedule a failover, but this is the path we must take to chain these plans together so we do the failover on the first and they all go one after another. We need to authenticate – we don’t want anyone doing this after all. Next we see a schedule screen and so you need to schedule a failover – in the future. Not too worry, we will not do that. You choose Next, and Finish. We now right click on the next plan and select Schedule. 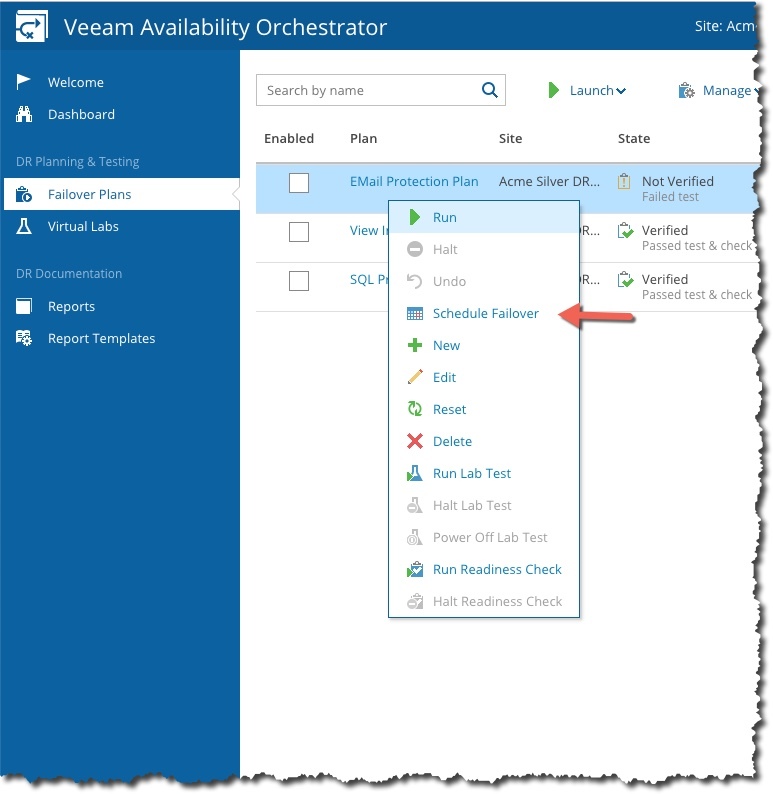 This time, we are enable the checkbox, but rather than select a date we will choose a plan to failover after. So select Choose a Plan button. In our case we are going to have this second plan fire after the first one. Now we Next, and Finish. Now we right + click on the last plan and select Schedule. Then we enable and select the previous plan. Then you do the same old Next, and Finish. Now when we look at our plans we see a little of what we have done – but not yet are we complete. You can see in the Failover Scheduled column how the email plan – first to be recovered – occurs on a particular date, but then we have View execute after SQL, and SQL recovery after Email. Now, we must right click on EMail and select Schedule. We must disable the scheduled failover. As you see above, remove the checkbox, and the typical Next and Finish. 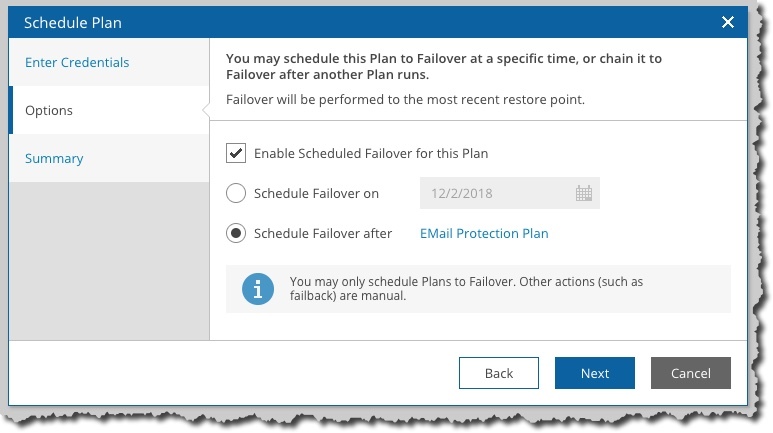 Now we see no scheduled failover for the EMail protection plan, but we still see the other two plans with Run after so if I execute a failover for EMail the other two will execute in the order we set. So things are good. Now one plan triggered will cause the next to execute. If you select EMail, it will trigger SQL which will than trigger View. The plans need to be enabled for this to work. Test failovers are not impacted by this order of execution. 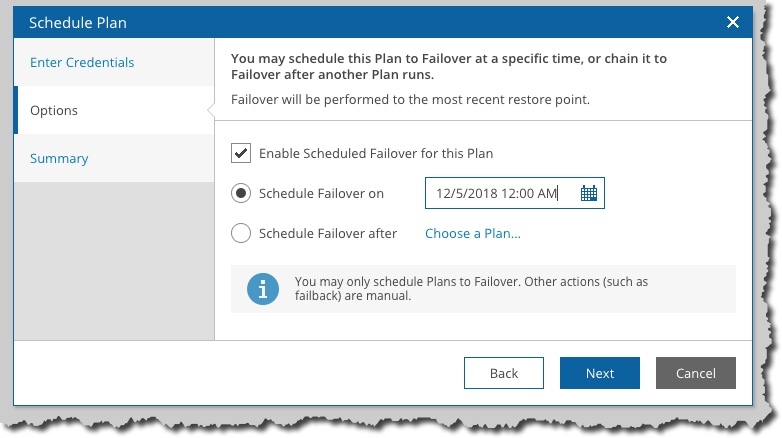 When you do a failover with any of these plans, you will be prompted to execute the other plans in the appropriate order. This will be enabled by default but you can disable it. One you have your plans chained, you should arrange a day and time to do a real failover to your DR site. It is the best way to confirm things are working. BTW, all of my VAO technical articles can be found with this link.